The remains were reported to be found near 118th Court, a quarter mile south of West 117th St. on Wanamaker Rd. 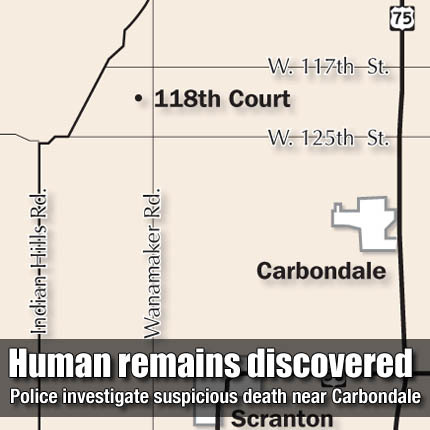 CARBONDALE—Human remains found near Carbondale Saturday have not been identified as of Tuesday, and officials don’t know the gender or age of the person or how long the remains have been there. Osage County Sheriff Laurie Dunn said a woman hunting for mushrooms near 118th Court, about four miles northwest of Carbondale, found human bones lying on the ground Saturday evening. The sheriff’s office received a report of the remains about 7:50 p.m., and responded by beginning a search of the area. “We have no identification of who it is. We’re not aware of whether the remains are male or female. We have no idea of the cause of death,” Dunn said Monday afternoon. She said that because the cause of death is unknown, the case is being handled as a homicide. Dunn said Monday that she had called in the Capital Area Major Case Squad, or the M-Squad, to assist in searching the area. The M-Squad is made up of numerous area law enforcement agencies that assist each other in major cases. “We’ve got 30 to 40 people walking fields trying to find more remains,” Dunn said. Throughout Sunday and Monday, additional searches were conducted, with no other suspected human remains found. Late Monday, search and rescue dogs from Missouri Search and Rescue were used to investigate the area. By Tuesday afternoon, the search of the area was called off. Dunn said in addition to the ground search, two nearby ponds were drained and a burn pile was excavated. Dunn said although other bones and bone fragments were found during the search, they were not suspected to be human, but a coroner’s determination will be necessary to be sure. The original remains found have been turned over to First Call Morgue, the sheriff said. That company, based in Kansas City, will examine the remains to determine the gender, age, and cause and time of death. Dunn said she hoped to learn some of that information within a few days, but DNA testing to try to determine identity of the person could take weeks or months to complete. In the meantime, the investigation will continue, she said. She said several properties in the area were searched, some with search warrants and other areas with landowners’ permission.